The new 2018 Subaru BRZ tS (tuned by STI) is a limited edition model that gets extra goodies setting it apart from the standard BRZ sports coupe. Is it enough to pay the extra money? This week review the new 2018 Subaru BRZ tS sports coupe and check out what sets it apart from the standard BRZ. Subaru released a new Limited Edition 2018 BRZ tS (tuned by STI) limited to 500 units. BRZ tS adds STI-tuned front and rear Sachs dampers and coil springs, and flexible V-braces in the engine compartment. New draw stiffeners are added to the chassis and sub-frame to improve steering response. For the first time, BRZ tS is also equipped with 18-inch lightweight STI wheels wrapped in 215/40 R 18 Michelin Pilot Sport 4 rubber for superior grip and quicker turn-in. Brembo brakes at all four corners round-out the package. BRZ tS is available in Crystal Black, Crystal White, and WR Blue. The 2018 Subaru BRZ tS ($33,495 plus $860 destination) comes standard with a tweaked chassis featuring Sachs dampers from the BRZ Limited’s available Performance package which has been tuned to complement 18-inch STI wheels and much stickier 215/40R-18 Michelin Pilot Sport 4 tires. The Performance package’s Brembo brakes make their way over to the higher-performance BRZ tS, with 12.8-inch discs up front and 12.4-inch at the rear. They’re mated with STI springs that are 15 percent stiffer in the front and 3 percent stiffer out back according to Subaru. There’s also a flexible strut-tower brace and a flexible lower front cross member brace, both of which use ball joints to limit noise, vibration, and harshness. BRZ tS gets more aggressive-looking faux intakes instead of fog lights, and an STI front splitter with a red stripe giving it a visually lower look. The sides are accentuated with STI skirts and black mirrors and the most noticeable change is the black carbon-fiber wing with an STI logo on each side. Subaru says it’s adjustable to fine-tune rear downforce for track driving. There’s another red stripe across the rear bumper and lower skirts on each side of the rear diffuser. 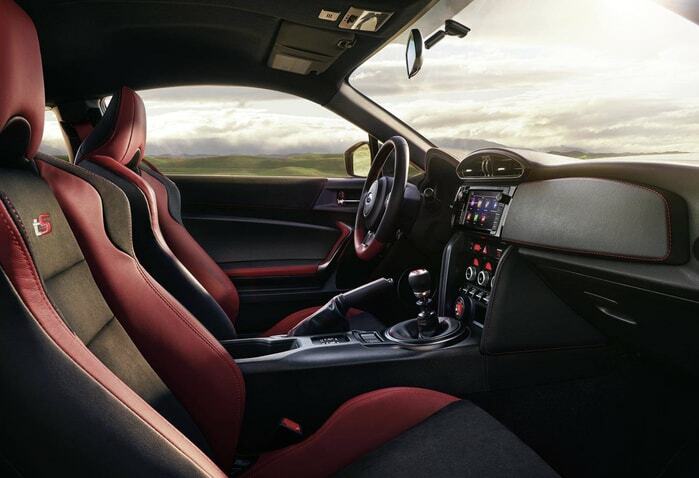 The 2018 BRZ tS’s all black interior gets more red accents inside, including on the steering wheel, seat bolsters, door panels, and seatbelts. There’s red stitching on the seats, door panels, steering wheel, shifter boot and brake handle. The supportive front seats get the tS logo on the setbacks. Also inside, are heated seats, aluminum sport pedals, a track mode, and we were surprised at the km/h digital display instead of mph on the speedometer. 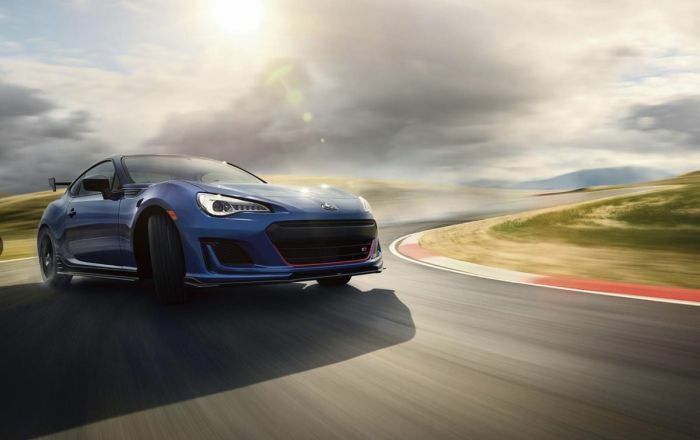 BRZ tS is powered by the same 2.0-liter naturally-aspirated Boxer engine as the standard model. It generates 205 horsepower and 156 lb-ft of torque. It comes mated with a 6-speed manual gearbox sending power to the rear wheels. EPA fuel mileage estimates come in at 20/27 city/highway and 23 combined mpg. The Subaru BRZ tS is for driving enthusiasts who want a superior handling sports coupe. It ramps up the fun-to-drive meter by a retuned suspension and stiffer springs. The SACHS performance shocks showed up in it’s superior covering ability in the corners. We took it up into the mountains west of Denver in the twisty roads near Evergreen. The BRZ tS kept its balance with minimal body roll as we tossed it around the tight curves. The rear-drive BRZ’s handling and body control is superb and inspires driver confidence, even without all-wheel drive. The Torsen limited-slip differential gives excellent rear grip on both sides, enabling sure footed exits. On one tight exit from the highway, we took the corner at 35 mph higher than the recommended speed, pushed it hard through the turn, and the sports coupe grabbed the pavement like it had paws. The tS’s Brembo brakes also inspired confidence this week as we found out how the BRZ stopped us quickly with its improved grip. The sport-tuned suspension is more firm than the Standard BRZ but still compliant, but it does get bouncy over rough pavement that can result in driver fatigue after a long drive, and the cabin is a bit noisy at high speeds. The 205hp BRZ boxer engine has enough power for most driving situations, and even at the high-altitudes where we tested the BRZ. With the 6-speed gearbox, it allowed us to keep the revs high and the power band at optimum levels. The 6-speed manual gearbox engages easily, and the short throw makes it a joy to drive. The 2018 Subaru BRZ tS offers more grip and control over the standard BRZ with an even more well-balanced character. With no changes made to the 2018MY BRZ tS engine’s 205hp, we came away feeling it needs more power to take advantage of STI’s excellent suspension teaks. It’s the one crucial flaw with this sports coupe. You can buy a 2018 Subaru BRZ Performance Package ($1,195) available on Limited trims with the manual transmission ($28,445) and get similar performance. It comes with the upgrade Brembo four-piston calipers and rotors on the front and dual-piston calipers and rotors on the rear. Sachs Performance shock absorbers are added to all four corners for improved ride and corning stability. Also included in the package are unique 17- in x 7.5-in black aluminum alloy wheels. The 2018 Subaru BRZ tS is $3,855 more than a Performance Pack-equipped BRZ Limited. We would spend that money on engine upgrades and you’ll be happier with the additional performance.